Senior Kaitlin Konopka set a new Shepherd stolen base record in the Rams matchup against Shippensburg. 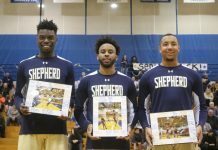 (Photo Courtesy of Shepherd University Athletics). 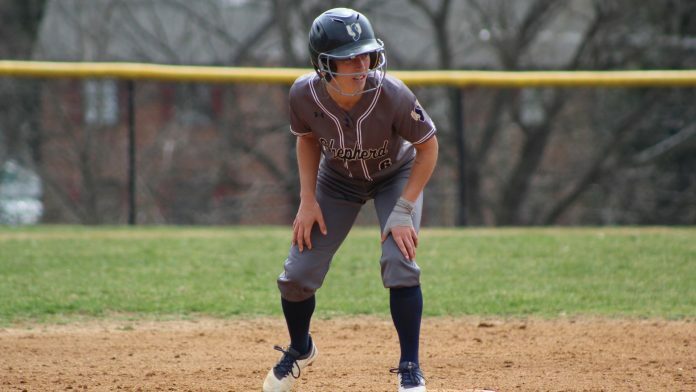 The Shepherd Softball team (28-6) held a double header against Shippensburg University (19-14), Tuesday April 9, 2019 and displayed another dominant performance not allowing a single point in either game, winning 2-0 the first and 4-0 the second game. Senior Lori Sturgill would be on the mound for Shepherd, starting the game off hot striking out the first batter. Sturgill had eight strikeouts out of 24 at bats, she also scored the first point of the game in the bottom of the second inning, off a single by Ashley Burger. Outfielder Kaitlyn Konopka singled to middle field in the third inning, and after a fly out she stole second base, setting a new Shepherd stolen base record with 63. In the fifth inning Allison Baker scored on a passed ball by the opposing team’s catcher, making the score 2-0. 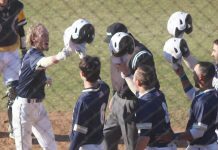 The Rams defense was clicking on all cylinders as they only gave up one hit out of 24 at bats. 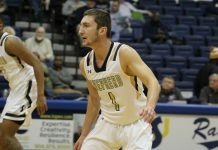 Shepherd, however, had a total of five hits out of 21 at bats. Burger led Shepherd with two out of the five hits. In the night cap game SU came out swinging in the first inning. Sturgill would double to right center field, bringing in Conner Gilligan and Nicole Purtell. Konopka would single to center field in the third inning, allowing Tori Seymour to come in for a run, making the score 3-0, at the bottom of the second. Taylor Stocks would get the start on the mound the second game, continuing to have an outstanding junior campaign. Stocks only allowed three hits on the day, with a total of five strikeouts. In the bottom of the sixth inning Seymour singled to left field, allowing sophomore Leann Brown to score. Sophomore Cheyenne Van Pelt came in to close the game only allowing two hits, forcing the Red Raiders to ground out. Securing the victory for the Rams, this was Van Pelt’s second save on the season.